mommy's reviews: Memorial Day Contest from The Stratford Apothecary! I have been notified that there is a $25 Gift Card up for grabs for someone from The Stratford Apothecary! This is in honor of our vetrans and soldiers who are currently fighting or have fought for the freedom of this great country. 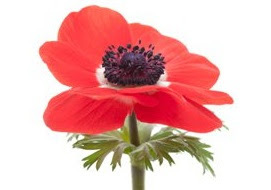 So, all you have to do is find the image of the poppy (pictured below) on The Stratford Apothecary's Website. Then, you go to their Facebook page and Like them there. Next, just post the link of the page on which you found the poppy. The first person to do so will win a $25 Gift Certificate to The Stratford Apothecary! Woo hoo! This contest will end on May 30th at 11:59PM.